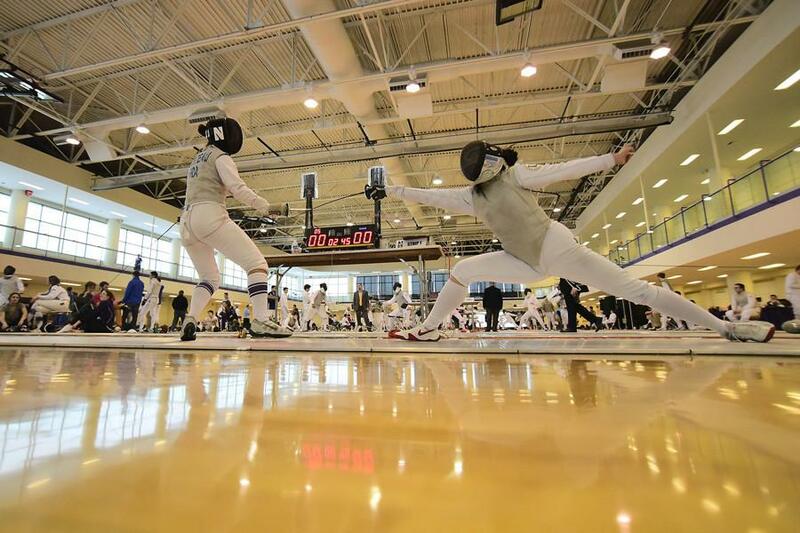 A Northwestern fencer parries away an opponent’s attack. The Wildcats showed well at the NU Duals, which served as Senior Day despite being hosted in South Bend, Indiana. It was a bittersweet weekend for Northwestern, as the team celebrated its seniors and coach Laurie Schiller, who earned his 1,250th career win at the NU Duals. At the seniors’ last home tournament, the Wildcats came out strong, winning 12 of 14 bouts, including a victory over No. 3 Princeton. NU also knocked off UC San Diego and Stanford, teams it beat previously at the Western Invitational, and took down No. 10 Temple and No. 9 Penn, teams the Cats were supposed to compete against last week at the postponed Penn Duals. Despite the event being considered NU’s “home duals,” the team traveled to Notre Dame in South Bend, Indiana, in light of on-going construction in Henry Crown Sports Pavilion. Freshman Maddy Curzon said she still felt as though they were at home because of the mentality surrounding Senior Day and the unity of the team. Junior Cindy Oh said being able to honor the graduating seniors in front of everyone at the meet, including other teams, motivated the squad. In a weekend full of highs, Schiller said it was probably one of the team’s most successful big duals, especially with the unexpected addition of Penn State to the tournament after the Nittany Lions’ dual match against St. John’s was canceled the weekend before. The NU Duals not only marked the last home meet for the seniors, but also for Schiller who will retire at the end of the season. The Cats showed no signs of rust after an extra week of rest following the postponement of the Penn Duals due to weather concerns. The team remained dominant after not fencing since an undefeated weekend at the Western Invitational. Even with a week off before the USA Junior Olympic Championships, the fencers said they will continue pushing themselves in preparation for stiff competition in Cleveland. They have a long way to go before they can rest, Oh said.